This harmonized set of soil parameter estimates for Latin America and the Caribbean was derived from a revised version of the 1:5M Soil and Terrain Database for the region (SOTERLAC, ver. 2.0) and the ISRIC-WISE soil profile database. The land surface of Latin America and the Caribbean has been characterized using 1585 unique SOTER units, corresponding with ... 5855 polygons. The major soils have been described using 1660 profiles, selected by national soil experts as being representative for these units. The associated soil analytical data have been derived from soil survey reports. These sources seldom hold all the physical and chemical attributes ideally required by SOTER. Gaps in the measured soil profile data have been filled using a step-wise procedure that uses taxotransfer rules, based on about 9600 soil profiles held in the WISE database, complemented with expert-rules. Parameter estimates are presented by soil unit for fixed depth intervals of 0.2 m to 1 m depth for: organic carbon, total nitrogen, pH(H2O), CECsoil, CECclay, base saturation, effective CEC, aluminium saturation, CaCO3 content, gypsum content, exchangeable sodium percentage (ESP), electrical conductivity of saturated paste (ECe), bulk density, content of sand, silt and clay, content of coarse fragments (> 2 mm), and available water capacity (-33 to -1500 kPa). These attributes have been identified as being useful for agro-ecological zoning, land evaluation, crop growth simulation, modelling of soil carbon stocks and change, and analyses of global environmental change. The current parameter estimates should be seen as best estimates based on the current selection of soil profiles and data clustering procedure. Taxotransfer rules have been flagged to provide an indication of the possible confidence in the derived data. Results are presented as summary files and can be linked to the 1:5M scale SOTERLAC map in a GIS, through the unique SOTER-unit code. The secondary data set is considered appropriate for studies at the continental scale (< 1:5M). Correlation of soil analytical data should be done more rigorously when more detailed scientific work is considered. Batjes NH 2005. SOTER-based soil parameter estimates for Latin America and the Caribbean (ver. 1.0). Report 2005/02, ISRIC - World Soil Information, Wageningen. 4) Dijkshoorn JA, Huting JRM and Tempel P 2005. 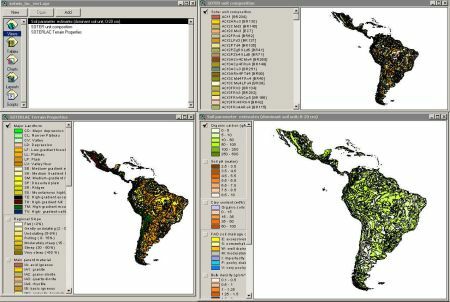 Update of the 1:5 million Soil and Terrain Database for Latin America and the Caribbean (SOTERLAC, ver. 2.0). Report 2005/01, ISRIC - World Soil Information, Wageningen. 3a9ed87d-affc-4f72-aa6e-72db4fefec40 Access to the portal Read here the full details and access to the data.